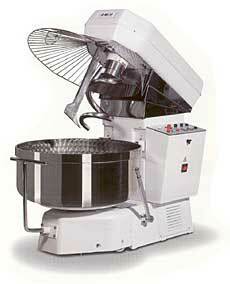 Spiral Dough Mixers from Esmach, Sottoriva and Berto Italia. 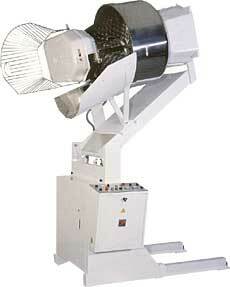 We offer a wide range of Spiral mixers in capacities from 30kg up to 300kg, in fixed bowl, removable bowl and tipping. The illustrations show the latest NSE range from Esmach with capacities from 30 - 200kg. Streamlined, easy to clean machines that offer high performance at realistic prices. Stainless steel bowl and mixing tool. 2 speed bowl and spiral. 60, 80, 100, 130, 160 and 200kg all with reverse action. Mounted on castors for easy cleaning. All stainless steel machines available. The Esmach ISE/A are a range of heavy duty machines with removable bowls in capacities from 130 - 300kg. Stainless steel bowl, spiral and guard. Two speed bowl and spiral. Low voltage control circuit and safety switch on guard. 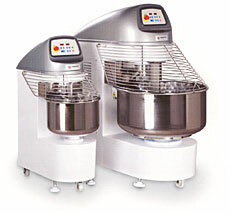 Automatic pre-set mixing programmes available. The Esmach ISE-130FR Tipping Spiral (shown in tipping position) is available in 130, 200 and 300kg capacities. Ideal for discharging directly into divider, reducing time and labour.